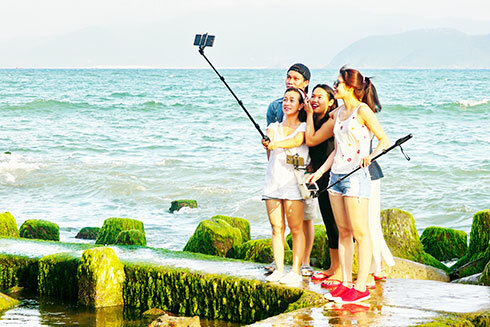 Only with an editor-installed smart phone and, indeed, gorgeous clothes, the young can easily check in destinations for more nice collections and information of any tourist attraction in Nha Trang. Nha Trang weather, following the New Year, is always cool and sunny. During this time, many people still want to save beautiful photos in places where were occupied by the crowd during the Lunar New Year that they could not take the same. One of the destinations most visited by the young is Kenh Ha Lake, now called Galina Lake. Located in Phuoc Dong commune, Kenh Ha Lake features a green grass path toward the Mat Khu Da Hang and ivory bamboo rows on both sides. Along the path, there are plentiful of flowers and swings for you to sit and pose. The beautiful wide lake has along-the-bank tents from which you can enjoy the beauty of the opposite forest with many green, red and yellow leaves. You can take a picture when taking the duck pedaloes on the lake or paddling the wooden boats for a wild experience. On one corner of the lake, there is a floating raft with a red heart shape and landscapes such as a bicycle or flower baskets on another corner for posing. 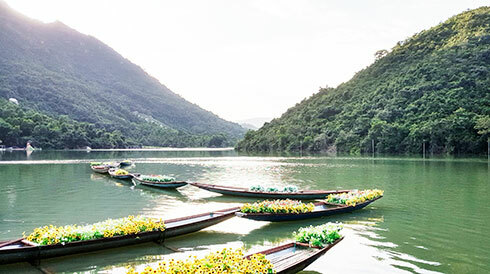 And from Kenh Ha Lake, along Nguyen Tat Thanh Street, 100-Egg Mud Bath Resort will catch your eyes. With the advantage of being located on the outskirts of Nha Trang city, this place covers a large area of up to more than 23ha. Also, this location features a cool green space. The lovely colorful eggs and the 23ha garden of bananas and areca will give visitors a close feeling of being in the village. There is also Kon Ku Lak village with the architecture of Raglai ethnic people, especially Cham Pa town which recreates ancient Cham architecture and culture and Ponaga flower garden in colorful spring days. Another corner you will definitely admire is Happy Beach, right on the coast of Nha Trang. This very hot spot for young people from morning to night is always beautiful for all time. Happy Beach creates an open space with unintentionally but designedly arranged things so that you cannot help checking-in. Those are very carelessly placed cars on the sand beach painted yellow, blue and white. These are old automobile tires painted in multicolored and overlapped for styling. These are colorful pinwheels blended with the sea color, bikes with flower baskets, net swing and small table in the magic space surrounded by snail shell curtain... All make one virtual living space which is very beautiful and for young people posing for beautiful pictures satiably. Nearby is the one and only moss rug at the foot of Tran Phu bridge. This place is essentially a breakwater, which is covered by moss day after day, forming a beautiful landscape. The moss rug is characterized a flat footpath and surrounded by beautiful, green-covered concrete dolosse, which looks drop-dead gorgenous. Stand on the moss rug and wait for the fossing prays and foam that erase the sky that it is extraordinary scenery. Nha Trang possesses many check-in points for all ages. Coming to here, you will feel relaxed and excited as you are immersed in nature. And so, you will get your own beautiful photos to show people on facebook, etc.